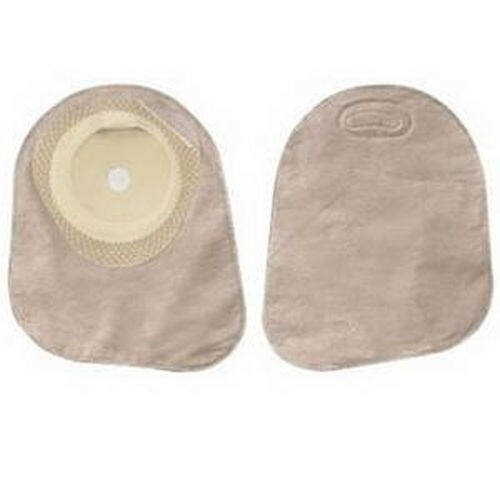 Hollister Premier Mini Closed Pouch with filter and pre-sized SoftFlex skin barrier - beige provides superior comfort and flexibility through the revolutionary air pocket technology in the dimpled, ultra-thin SoftFlex® skin barrier. It is a standard wear, thin and highly flexible hydrocolloid skin barrier that provides gentle adherence to the skin. It is formulated for gentleness and flexibility, yet attaches firmly to skin. It also has integrated filter which helps eliminate gas build-up (pouch bulging). Integrated filter helps eliminate gas build-up. Discreet pouch shape and size.